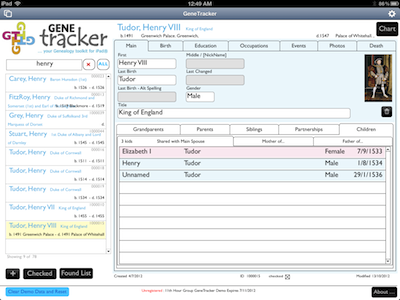 GeneTracker is a Family History Management toolkit for organising your Genealogical research. Essential companion for your Family Reunions. Handy assistant at your High School Reunion. Keep your photos, document scans, video clips, sound bytes and other files inside the database, linked to individuals they refer to. Being mobile lets you enter information where and when you find it... at the Library or at the homes of family members. 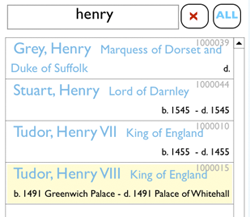 Our GeneTracker sampler file contains some of the family history of Henry VIII King of England to illustrate the various features. GeneTracker can be reset and cleared of this data so you can start entering your own family history. 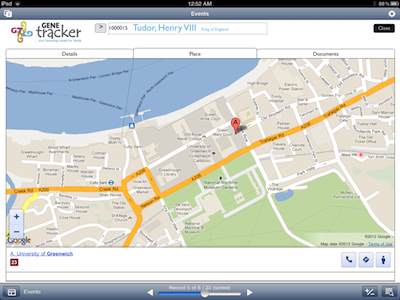 FileMaker® Go is available as a FREE download from the Apple iTunes® store. 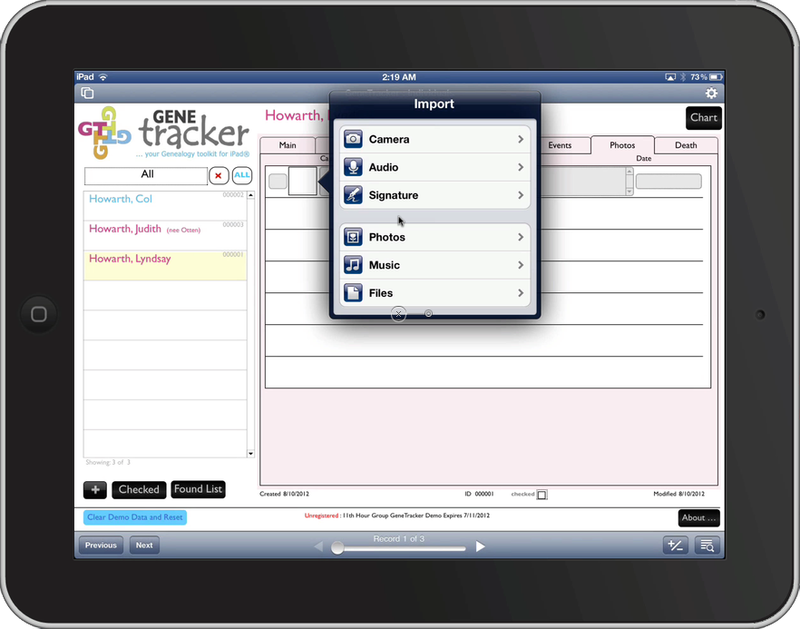 GeneTracker will allow you to create people records and link them to other people via many relationship and event types. Children, Parents, Grand Parents, Great Grand Parents are all simple to view and edit. 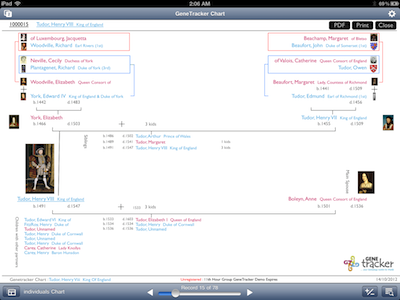 All basic birth, death, marriage and divorce details can be recorded in the main view. 'Spouse' must be recorded as "Main Spouse" to show "Children" of the couple. Separate views list 'Mother of' and 'Father of' kids from other partners. Defacto and other partnership changes, education, occupations, accommodation, incarceration, military service and any number of other important life events can be recorded. Events can be linked to multiple relevant documents. Events can also be linked to an "Other Person Involved" which allows the Event to be also seen from the other person's record in "Other's Event Mentioned". Intelligent formatting makes it easy to spot missing information. Events with addresses can be seen on a google™ maps view. A photo library allows images to be saved direct from the iPad camera or imported from other sources. They are given dates and captions. Search-as-you-type feature allows entry of custom search criteria from all values entered. eg. enter 'joh' and the list will show people with 'joh' at the begining of any of their names. Individuals can be "checked". All "checked" records can then be found and listed using buttons provided. The FileMaker Go app toolbar is also accessible for custom searching and browsing records. 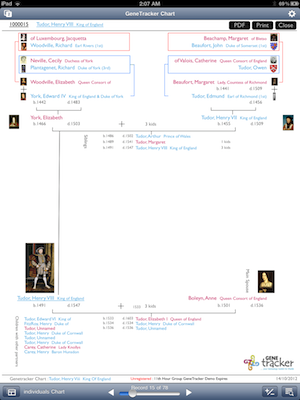 An interactive 5-generation ancestral chart, centres around an individual and allows easy navigation between family members. Parents, Grandparents, Great Grandparents, Main Spouse, Siblings and Children are shown on the chart. Offspring from partners other than the "Main Spouse" are also shown. Click any name and the chart re-centres around that individual. Print Portrait view which is ideal for note-taking. Take your iPad to family events so others can contribute factual and anecdotal details before they are forgotten. Take a photo of the new baby and instantly add it to her profile. If Granny finds a photo or a birth certificate of Great Uncle Fred... just take a snapshot straight into Fred's GeneTracker photo-library or events section documents. The GeneTracker GO Sampler allows a 30 day trial after which you may have entered details you don't want to lose. KEEP your sampler file and import the data into your purchased copy. GeneTracker is available in GO, Pro and Server versions. When the standalone GO version needs to be shared, talk to us about an upgrade. GeneTracker GO will work on the iPhone but it will not be an optimal size for data entry and navigation and the buttons will be too small for most large fingers.